1 GB Port Dedicated Server Take advantage of a professional and innovative server hosting provider and of reliable and powerful dedicated servers based on Linux or Windows. Our dedicated root servers provide you with the latest server hardware, strong processors, unlimited traffic and the highest level of server availability, flexibility and efficiency. Get your own dedicated server for your individual business needs at prices you can afford or create your customized and individually configured server for your special requirements. Our 1 GB Port Dedicated Servers are not a one-size-fits-all solution. Everyone has different requirements, and by custom-building each dedicated solution, it allows us to match your needs and provide you with the lowest price possible. Like everything at A1dreamerz, all of our dedicated servers have unlimited bandwidth, and we can get you online for as little as $99 a month! Contact us using the information at the right and we’ll get your dream server up and running in no time. You can also get up and running much faster by selecting a pre-built servers below. 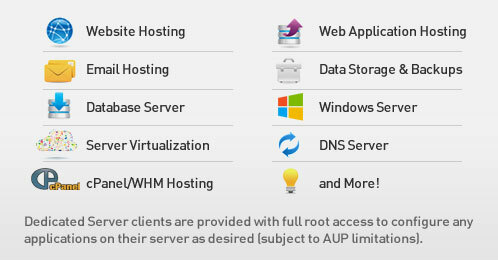 ServerPronto’s Dedicated Server come preconfigured with the essential applications you need for your hosting operations. Our customers have full root access on any of our Dedicated Server packages and can configure or install any application as desired (subject to AUP limitations). From classic web hosting to the new world of cloud virtualization your opportunities are endless with a ServerPronto Dedicated Server. If website hosting, database management, application hosting or reselling we make sure your A1Dreamerz Dedicated Server meets your hosting needs with multiple Linux and Windows operating system options to choose from. At A1Dreamerz, we are committed to providing the best speed, reliability, and value in the dedicated server business. This means constant innovation to deliver the highest performing network and customer control at the lowest price available. Whether you are using your server for web development, tinkering, email, photos, gaming, reselling, or all of the above and more, we strive to deliver a world-class product. Our network uptime is the best in the business. Our relentless focus on value helps us deliver competitive prices every day. And we provide responsive and experienced 24/7 customer support via e-mail and our ticketing system.